Elaborate discriminatory laws existed in Great Plains states with large African American populations such as Texas, Oklahoma, and Kansas, while Nebraska, Colorado, Wyoming, and Montana, with smaller minority populations, created limited and often unenforced segregation laws. Because of small African American populations, North and South Dakota created no such laws. Except for Texas and Oklahoma, with their large rural African American populations and Southern views of race relations, Plains states applied segregation laws almost entirely in towns. Other forms of segregation in these states existed as a matter of custom. Hispanic Americans and Native Americans also faced discriminatory laws. Texas adopted a state constitution in 1876 that required segregated schools for African Americans. Some local school districts also segregated Hispanic students. The legislature in 1876 allowed jury commissions that could eliminate African American jurors. In 1891 the legislature allowed segregated railroad cars. Six years later it outlawed interracial sexual relations. Texas added a constitutional amendment in 1902 requiring a poll tax for voting that fell primarily on working-class African Americans and Hispanics. In 1903 a new election law allowed political parties to exclude minorities from white primaries. Texas strengthened that law in 1923. Several towns segregated public accommodations and transportation. Some West Texas counties excluded African American settlers by customs known as "sundown laws." The first Oklahoma state constitution in 1907 segregated public schools. The legislature added laws segregating transportation and forbidding intermarriage. Oklahoma later segregated various public accommodations, while some towns segregated residential areas. In 1910 the state adopted a literacy test and a grandfather clause to disfranchise African Americans. Both measures were declared unconstitutional by the U.S. Supreme Court in 1915 in Guinn and Beal v. United States. Segregation laws in Kansas dealt primarily with education. The state constitution of 1859 specified separate African American schools. Soon the Kansas legislature created county school districts in which African Americans could attend white schools if no separate institution existed. In 1874 the state passed a civil rights law that forbade segregated schools. Five years later the legislature revised the school code to allow towns of 15,000 population to establish separate primary schools for African Americans. Secondary schools were segregated only in Wyandotte County. African Americans challenged segregated schools, but the Kansas Supreme Court upheld the segregation statute. Wyoming passed a law allowing a school segregation law in 1899. In 1913 the state made miscegenation a misdemeanor. Nebraska passed a similar law against miscegenation in 1911. While some de facto segregation existed in the state, no other Jim Crow measures became law in Nebraska. Montana, with its large Native American population, denied voting rights to persons under federal "guardianship" in 1871 and forbade voter precincts on reservations. In 1889 the state opened voting to all male persons except Native Americans. After the federal Indian Citizenship Act of 1924, Montana divided counties into at-large districts to dilute the impact of Native American voters. In 1937 the state ruled that all deputy voter registrars must be taxpaying residents of their precincts. Since Native Americans were exempt from some local taxes, they could not act as voter registrars, and tribal voter registration was effectively limited. 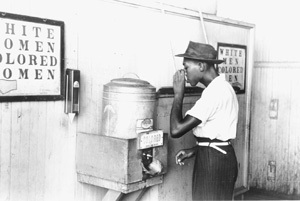 In the early twentieth century Jim Crow laws on the Plains began to face challenges. Important court cases included those in Texas that outlawed the white primary by the early 1940s. After earlier court cases in Texas eliminated Hispanic school segregation and Texas and Oklahoma cases outlawed segregation at the law school/graduate school level, the U.S. Supreme Court in Brown v. The Board of Education of Topeka ruled against legal school segregation on the basis of race in 1954. See also AFRICAN AMERICANS: Civil Rights. Barr, Alwyn. Black Texans: A History of African Americans in Texas, 1528–1995. Norman: University of Oklahoma Press, 1996. Svingen, Orlan J. "Jim Crow, Indian Style, 1980s." In Peoples of Color in the American West, edited by Sucheng Chan, Douglas Daniels, Mario T. Garcia, and Terry P. Wilson. Lexington KY: D. C. Heath and Company, 1994: 352–63. Taylor, Quintard. In Search of the Racial Frontier: African Americans in the American West, 1528– 1990. New York: W. W. Norton, 1998.